Introduction to 'Goethe, Faust, and Science' seminar. I am not going to provide detailed biographical information on Goethe, which is easily available (see also the links on the seminar webpage), but I will make just a few remarks to put his life in context. Johann Wolfgang von Goethe was born in Frankfort-am-Main in 1749 and studied law, under his father's insistence, at Leipzig from 1765–8, during which time he also wrote his first two plays. His studies were interrupted by an illness (on which, more below), and after his recovery he went to Stassbourg in 1770 to continue his law studies (but he also explored anatomy, antiquities, and alchemy). He was a literary critic until 1776, when he accepted a post with the young Duke August of Weimar. He was a valuable public servant, and conducted a geological survey of the region, which further developed his scientific interests (see below). He also produced novels, poetry, and plays. 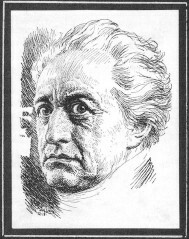 Goethe began work on Faust in 1773 and after extensive revisions, he published a part of it in 1790. With Schiller's urging, he completed Part I in 1806 and it was published in 1808. Although some of Part II had already been written, he continued to work on it the rest of his life. Finally, in August, 1831 Goethe wrapped up his completed manuscript of Faust, handed to his secretary Eckermann, and gave him instructions on how it was to be edited and published after his death. Goethe told him, "I am now finished my life’s true work, anything I do further and whether I do it or not, is all the same!" He was dead within a year. Goethe tells us that he began to study alchemy with a Fräulein von Klettenberg in 1768, when he was at home in Frankfort from Leipzig University to recuperate from an illness (perhaps depression). His interest may have been awakened by a "Universal Medicine," which was administered by an alchemist friend of von Klettenberg and to which Goethe credited his cure. (Von Klettenberg and this Dr. Metz were members of a Pietistic circle associated with the Moravian Brethren, a heretical sect.) At that time he read a number of alchemical and Hermetic texts (which were widely available in Frankfort) and began practical alchemical experiments (directed toward healing rather than transmutation). These continued over the next year, but we read no more about them after he went to the University of Strasbourg in 1770. Nevertheless, these experiments left a lifelong impression on him, and we know that he continued his "mystico-religious chemical pursuits" (as he called them), in part as an antidote to the dry pedantry of the universities. (Faust expresses the same sentiment in his first scene in the drama.) Furthermore, alchemy provided for Goethe a structure of ideas, which we recurs throughout his scientific work as well as Faust. Although best known as a novelist, dramatist, and poet, Goethe considered his scientific work to be more important than his literary activities. Already in the 1780s, when Goethe was in his 30s, he was studying geology, botany, and anatomy. Some of these investigations were connected with his post as overseer of mines with the Duke of Weimar. Goethe's scientific work has been criticized by scientists, even in his own lifetime, but as we'll see, it has been misunderstood because it is based on different conceptions of what science ought to be. In recent decades there has been an increasing interest in Goethe's philosophy of science, which is a consequence of a growing recognition of the limitations and deficiencies of current science and technology, which might be ameliorated by some of his ideas. Go back to previous section.